For most of 2015 I have been banging on about disrupting insurance (or Instech, if you like that kind of jargon). I’d like to use this blog post to talk about why I find it exciting. Life insurance premiums are $2.3 trillion globally. Non-life insurance premiums are $1.4 trillion globally. (both numbers are from 2012, from Mckinsey report linked to below). I don’t get to write the word trillion often when looking at market sizes. The insurance industry in Europe and the US is mostly composed today of large traditional insurers who have been operating for decades or centuries. They have struggled to adapt to a digital age, as shown by the graph from BCG below. Similarly to banks, their backend software and underwriting is tied into legacy software from previous decades, with major system integration challenges. 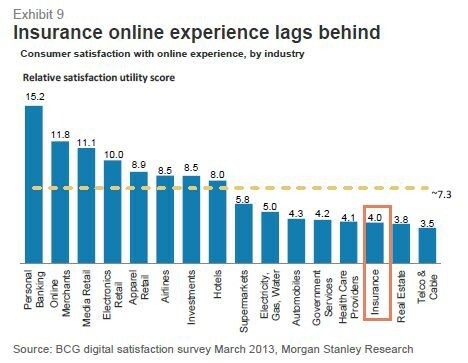 Insurers also have very little contact with their customers, contributing to low brand loyalty and retention. Balance sheet. Once you get through the regulation above, you need to prove that you have the balance sheet to be able to pay up for claims in any eventuality. This requires serious capital before you can write your first policy. Partnering with incumbents. Both of the above make it near-impossible to start afresh, unless you can raise Oscar-like $100M+ sums . Any other Instech startup is going to need to partner with existing insurers. This presents a number of challenges and limits flexibility. Some insurers are trying to encourage innovation (e.g. axastrategicventures.com/) but good intentions are confronted by big company politics, vested interests and ‘not invented here’ syndrome. Historic data. If you are going to get into underwriting insurance you need historic claims data on which to base your decisions. However this data is privately held by insurers. Building up enough data over a long enough time frame (given that claims are infrequent events) is a real challenge. Without it there is a danger of startups mispricing risk. For the likes of Alphabet/Google, Facebook and Amazon insurance is too hard and too boring. When you have a huge warchest self-driving cars and drones are much more interesting areas to explore. In the war for engineering talent it is hard to get your best developers to work on financial services. When I was with Google in 2007–09 I worked on the early days of ‘Google Compare’. Despite much hand-wringing in the insurance industry this hasn’t gone anywhere. It’s just not high enough up Google’s priority list. Ping An is one of the most impressive growth stories of any company globally. 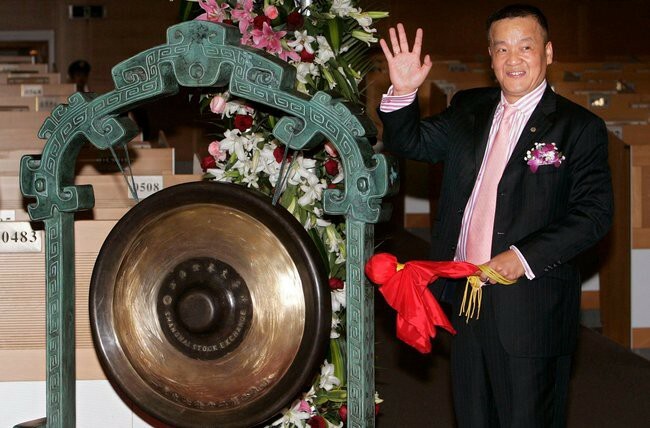 It was founded in 1988 in Shenzhen and was the first insurance company in China to adopt a shareholding structure. It took the nascent Chinese insurance industry and put a rocket under it, going IPO in 2004 at a $10B valuation,. It is now worth $100B. Ping An has always been a technology-led company and continues to lead the way in tech-led innovation. You can read more on this in the BCG reports below. Moneysupemarket was the first player to really crack insurance comparison, allowing users to type on their details once and receive competing quotes from dozens of insurers. It was quickly copied, leading to a fierce TV and Google ad spending war with Comparethemarket, Confused and Gocompare that continues to this day. Despite this it is still worth almost $3B. esure was founded in 2000, went public in 2013 and is now worth $1.5B. Its success has been built on on efficient low cost operations, and building brands (both esure and Sheilas’ Wheels ). It also owns Gocompare, one of the players in the UK comparison market. Over the last year I have seen a step change in the number of startups going after insurance. But this change has been from ‘almost none’ to ‘a trickle’. Tiny in comparison to the huge number of startups going after the similar-sized fintech market. Below I highlight a few of the areas in which I see Instech startups emerging. Knip. Mobile-first insurance concierge. Initial proposition for users is to remove admin pain: have all of your insurance policies in one place. Over time there is the potential to be a user’s trusted insurance advisor, recommending where they should increase/decrease cover and who they should insure with. Started in Switzerland, now taking on German market with competition from Safe and Clark. Policy Genius in the US is a different twist on the insurance concierge concept. Boughtbymany. Social distribution for niche insurance. Boughtbymany finds niche groups who have challenges finding good insurance today (e.g. diabeticus, young drivers). It plugs into these affinity groups to push specially-designed insurance products to them. Simplesurance. Seamless insurance cross-sell at checkout. The idea of selling insurance for high value items at point of purchase is not a new one. Simplesurance’s innovation is to make it as frictionless as possible for users and online retailers. In our persistent low interest rate environment new capital is flowing into the insurance industry in search of returns. One manifestation of this is hedge funds getting into reinsurance. As a startup one opportunity is peer to peer insurance, where a group of members pay out cover some or all of claims made by the group. In some ways this goes back to the original concept of cooperative insurance. The advantages should be less fraud, lower acquisition costs (through referrals/social), greater loyalty and over time better pricing. Friendsurance in Berlin was the first company with this approach. Guevara in London is a different take on the P2P concept. Connected devices and other online data offer insurers a huge amount of additional data on their insured risks. The first success story has been telematics for car insurance, where your driving behaviour affects your premium. A number of good businesses have been created, such as Insurethebox which sold 75% of the business at a valuation of ~$200M earlier this year. However so far telematics has remained a niche product, in particular addressing young drivers. Connected cars and ubiquitous smartphones will take it to the mass market. Going forward there are many more opportunities to use connected hardware to refine insurance: wearable devices for healthcare, smart homes for home insurance, mobile phones for almost anything. There is also the opportunity to use people’s online presence and social networks to reduce fraud and (possibly) improve underwriting. Climate Corp Collecting weather data with high precision, offering farmers crop insurance and in depth analytics. Metromile. In the car insurance telematics space, but using your smartphone to collect data, and a new pricing approach (pay per mile). Vitality Keeping fit and healthy reduces your health insurance costs. Data takin in from partners and wearable devices. Has grown to 5.5M members. Oscar are also using data from wearable devices for their insurance. This is a broad category, including changing how claims are handled, how insurance is sold and how it is bundled with other services. Oscar is the best example of this, reinventing US medical insurance from the bottom up. It has been well covered by the tech press so I won’t go into it further here. Aircare is part of Berkshire Hathaway, but worth a quick mention as it eliminates claims completely — it automatically pays out if your flight is delayed. Claims management is the most painful part of dealing with an insurer, with expensive offline measures to try to combat fraud. As everything we do becomes connected (starting with our car) the concept of ‘claiming’ may become an anachronism. There is always a new category emerging for insurance. Smartphone insurance has seen huge growth. Cyberinsurance is a current hot topic. However addressing these new lines of business is something that insurance insiders are pretty good at. Unless a startup can come in with a real tech advantage (which in cyberinsurance might be possible) the worry is that new segments quickly become competitive. The insurance market is still in its early stages in much of the developing world, offering opportunity for land grab. Compare Asia is an example of one company addressing this. DirectAsia, acquired by Hiscox, is another. SaaS to help the insurance industry keep up. The insurance industry is more than big enough for a SaaS provider focussed on the industry to build a $B business. There is a lot of excel still being used. The question is which parts of insurance require unique software, as opposed to a slight customisation of generic business intelligence, CRM or machine learning SaaS packages. A couple of insurance-specific SaaS companies are Quantemplate, offering business intelligence and data warehousing, and Shift Technology in fraud detection. Balderton’s portfolio company InterResolve are a different sort of B2B insurance company, with a technology-led approach to insurance claims mediation. Founding team who combine deep understanding of the insurance industry with an external, tech-led DNA. This probably means two founders, or a truly exceptional founder who can combine both. This is not an industry you can bluff your way through. On the flip side, I worry that a team of insurance industry insiders will struggle to break from industry norms. Real tech DNA in the company (something I look for in any sector). A clear focus on the customer, not the insurer / partner. Simplicity: an ability to take a complex industry and present it in a beautiful way using plain language. If you are an insurance startup in Europe than I haven’t spoken to before, please contact me!